It is a design pattern that separates behaviour from dependency resolution, thus decoupling highly dependent components. 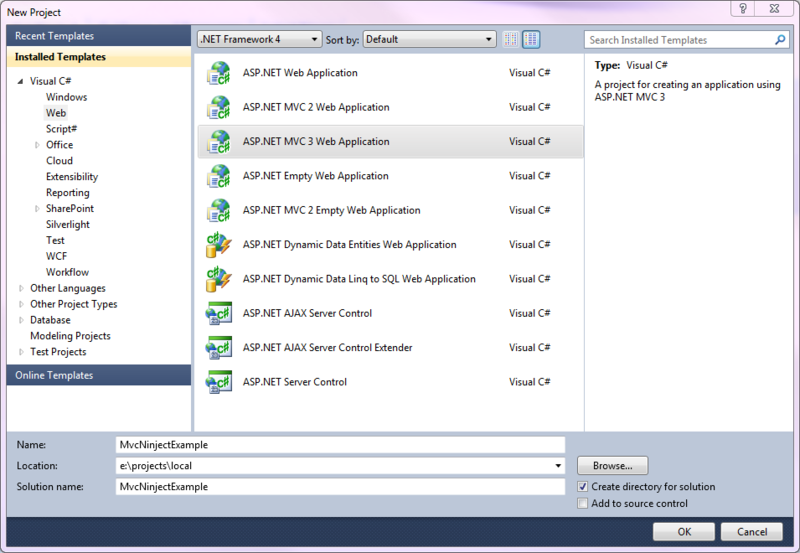 Later, I demonstrate the use of Dependency Injection within the context of an Asp.Net MVC 3 application. Dependency Injection (or DI) allows us to provide implementations and services to other classes for consumption in a very loosely-coupled way. The key tenet is that such implementations can be swapped out for other implementations by changing a minimal amount of code, as the implementation and the consumer are linked by contract only. In C#, this means that your service implementations should adhere to an interface, and when creating consumers for your services you should program against the interface and not the implementation, and require that the implementation is provided for you, or injected rather than having to create instances yourself. Doing this allows your classes to not worry about how dependencies are create nor where they come from; all that matters is the contract. The key thing to notice is that the constructor, we require that something which implements ILogger is given to us, but again notice that we don't care about where the log goes or how it is created. We can just program against the interface and not worry about it. This happens without any changes to the implementation of DirectoryWatcher, and this is the key concept. We are injecting our logger implementation into the consumer, so that the consumer doesn't have to create this instance on its own. 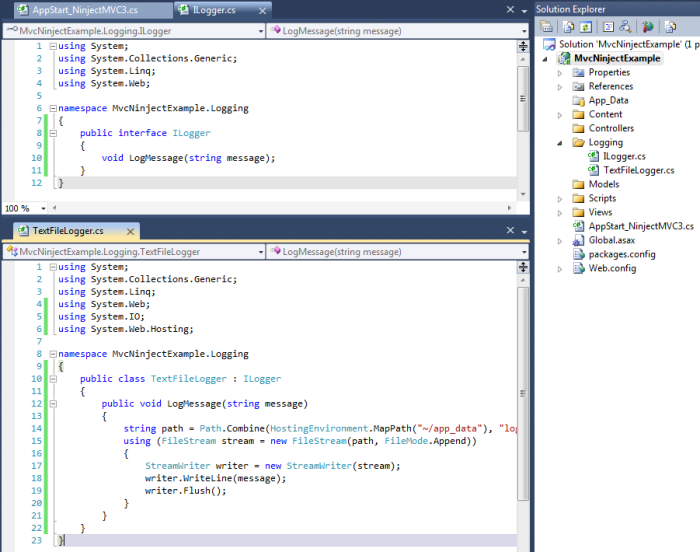 The example shown is trivial, but imagine using this in a large-scale project where you have several dependencies which need to be used by many times more consumers, and then suddenly a requirement comes along which means that the method of logging a message must change (say the messages are required to be logged into Sql Server for auditing purposes). Without some form of dependency injection, you will have to carefully examine the code and change anything which actually creates an instance of a logger and then uses it. In a large project this can be painful and error prone. With DI, you would just have to change the dependency in one place, and the rest of your application will effectively absorb the change and immediately start using the new logging method. Essentially, it solves the classic software problem of high-dependency and allows you to create a loosely-couple system which is extremely agile and easy to change. Many DI frameworks which you can download and use go a step further and employ the use of a Dependency Injection Container. This is essentially a class which stores a mapping of types and returns the registered implementation for that type. In our simple example we would be able to query the container for an instance of ILogger and it would return an instance of TextFileLogger, or whichever instance we had initialised the container with. This has the advantage that we can register all of our type mappings in one place, usually in an Application Start event, and that gives us quick and clear visibility as to what dependencies we have in the system. Also, many professional frameworks allow us to configure the lifetime of such objects, either creating fresh instances every time we ask for one, or re-using instances across calls. The container is usually created in such a way that we can get access to the 'resolver' (the thing which allows us to query for instances) from anywhere in the project. Finally, professional frameworks usually support the concept of sub-dependencies, where a dependency has itself one or more dependencies to other types also known to the container. In this case, the resolver can fulfil these dependencies too, giving you back a full chain of correctly created dependencies according to your type mappings. /// Maps an interface type to an implementation of that interface, with optional arguments. Asp.Net MVC 3 is very well suited to dependency injection as it provides hooks and the framework for any DI vendor to create a suitable container. Whenever any controllers or views are created, they pass through the DI container for dependency resolution. It also provides a global way to retrieve dependencies from anywhere within the project. 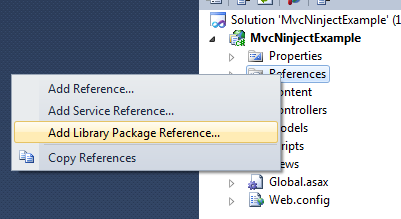 Ninject (http://ninject.org/) is a DI container especially written for .Net and now has code to specifically make use of the new DI features in MVC 3. 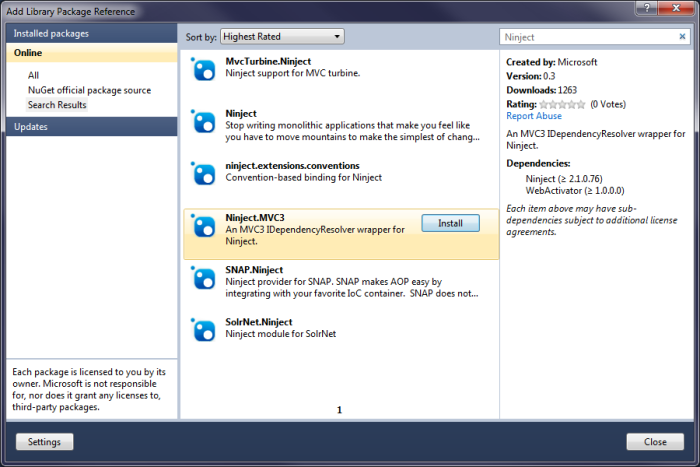 Coupled with the latest versions of MVC 3, VS2010 and the popular Nuget Package Manager, it is extremely easy to get up and running with DI using Ninject within an Asp.Net MVC 3 project. After this screen you will get a dialog asking you to choose an Empty application or an Internet Application - just choose 'Empty'. This will download Ninject and all the other things it needs in order to work, including the WebActivator library, which gives us a place to create our dependencies. You can see here how the Ninject Kernel is created, which is responsible for resolving our types. In RegisterServices() is where we would bind our contracts to our implementations. The DependencyResolver is used to register Ninject for type injection, which means that Ninject is used to resolve dependencies whenever they are needed by MVC. 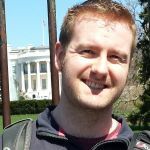 Let's have a quick look at how we can apply our logger to this and get our controllers using our logging framework. Note that I have also created the App_Data directory (which is needed by the TextFileLogger) so that the log file has somewhere to go. Finally, lets create a controller which uses it. Right-click on the 'Controllers' folder in Solution Explorer, select 'Add >' and choose the 'Controller' option at the very top. Give it a name of 'HomeController' and press enter. Inside this controller, we create a constructor which takes a parameter of MvcNinjectExample.Logging.ILogger, and we'll save that into a class-level private variable for later. Ninject is going to give us the actual implementation of that in accordance with the bindings we set up in the last step. I've also modified the index view so that is just returns a piece of content rather than looking for a view; this is just to prevent exceptions from being thrown as Iâm not creating a view for this example. Finally, I've also called into the logger from the index view to log a message for us. 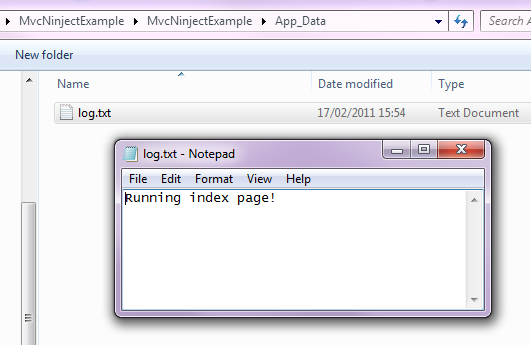 After we run the page, we should get a log.txt file in the App_Data directory containing our message. This is the general pattern you will use with Dependency Injection in MVC; including your dependency contracts in your controller's constructor, having Ninject fulfil the dependencies for you then consuming them from within the controller actions. As we intended, without doing any additional code than what I've presented here, we now have an instance of ILogger passed to us when the controller was created. This has happened because MVC has effectively asked Ninject to create this controller for us. During creation, Ninject has noticed that it requires an implementation of ILogger in order to create this controller. Since we registered a binding to ILogger in AppStart_NinjectMVC3, it knows how to create one of these and so it can go ahead and completely fulfil the dependency on this controller. Hence we have Dependency Injection. If you were to change this to use our EventFileLogger implementation as in one of the earlier examples, you will see that all you would have to do is create the implementation, make it implement ILogger and then register it in your kernel bindings. No changes to any controllers which use it are necessary. You should now follow this pattern when adding more dependencies to your project, and as your project scales in size you will see how easy it is to manage components in a loosely-coupled fashion even within a web project such as this. It gives you lots of flexibility and ultimately makes your projects a lot more maintainable and easy to change and adapt.